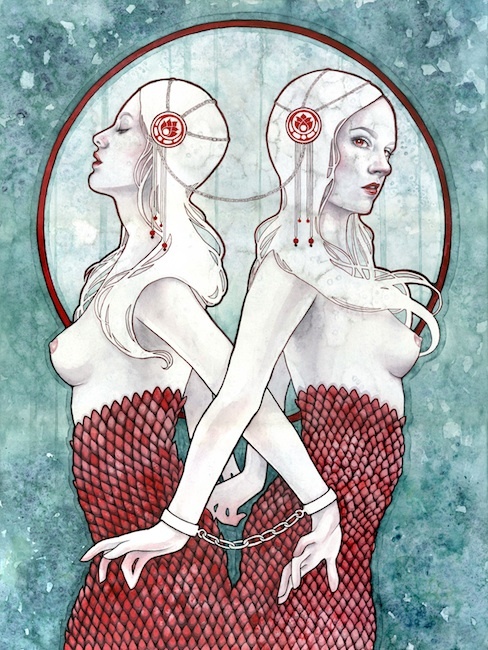 Artist and illustrator Kelly McKernan’s work is mythic and primal. 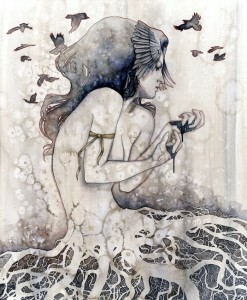 The human form is often hybridized and McKernan’s favorite human form seems to be the female figure, at least in part. In Fester the torso of a woman crowned with a raven stands on the gnarled roots of a tree, and in Sentry, red-tailed twins are bound by flesh and chained wrists. Still other figures have dragonfly wings, rabbit ears, and hair of coral. The works engage the language of fantasy with such strength that they transcend; dedicated looking leads us to discover that the works are actually literally felt and transcribed. It is through this dual-charged language of lush watercolor that the tales of internal struggle and personal growth unfold. In Fester we immediately sense heaviness. There is an opposition between two worlds, two planes, two distinct realities being represented by earth and sky. The figure appears in the moment of transition, and while we sense the struggle, we wonder if our black-haired maiden is trying to shake loose from her holdings to soar or fall away from the shadows to ground herself. In Sentry we may consider the exhibition title – Cognitive Dissonance literally – and wonder if the two figures depicted are actually the duality of a single character whose headdress and elevated glance carry the suggestion of status. We turn again with curiosity to the figure’s chains and wonder if the cost of freedom has anything to do with the integrity of self – at choices made or unmade. What is so thrilling about these pieces is their open-endedness, their ability to expose the untold stories of internal struggle, resolution, understanding, and self-acceptance, in a language that is both ethereal and gritty.